1. If you never order, can’t seat here. 2. 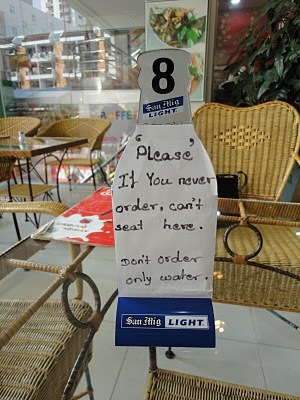 Don’t order only water. They must have had some bad experiences in the past. Really! Because thai's are usually kinda relaxed about these things. I've even seen places where locals bring their own drinks and just sit and chill if not too crowded. Yes, how true, but this sign seems not to be intended against the locals, but more specifically against Africans, so I was told. Here in Pratunam the're quite a lot of them. Some are using the cafe/restaurant on the picture as a hangout. I'm not sure and I don't want to judge based on race, but I find it hard to conceive they all can make a living out of just buying fashion here and selling it back home or are merely having a holiday.